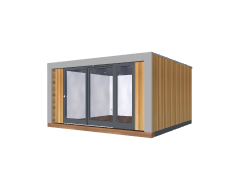 The Cuberno is our most popular design of garden offices and studios. The design draws its inspiration from Le Corbusier. Its basic shape and form hide the quite technical, detailed and challenging complexities which need to be overcome in order to achieve the contemporary look. 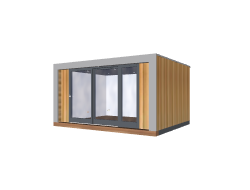 An integrated covered deck area merges the outside space and the inside, providing a visual extension of the space in winter and an actual extension for the remainder of the year. Smart, contemporary sliding doors and floor to ceiling glazing dissolve the boundaries between indoors and outdoors, integrating the space with the garden and flooding the internal space with natural daylight.